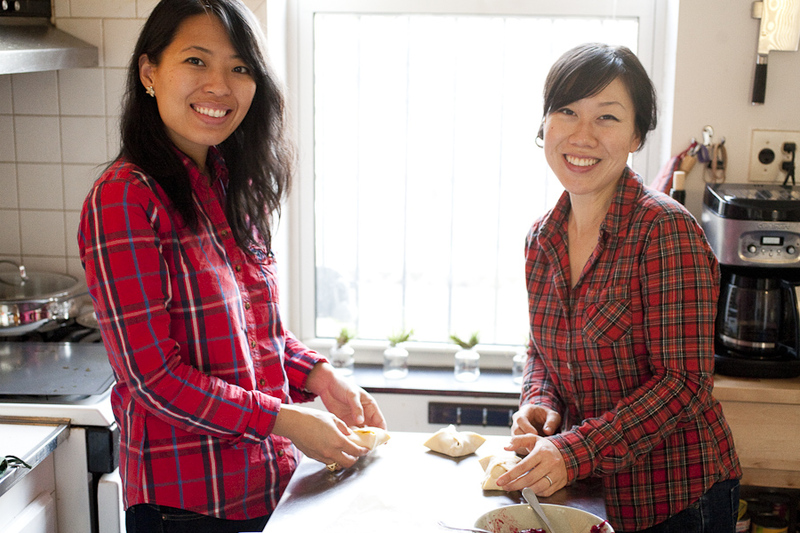 Two friends with different career paths and a shared passion for food put their heads together and start a website to share that passion with others. It sounds familiar in the best way. But take note, multi-taskers: these women are doing a lot more than running Pantry Confidential in their 'spare' time. Christine waits tables at a local restaurant, in between sharing her latest behind-the-camera work with the rest of the world, and Hana spends her nights immersed in culinary school and dishing on her blog. C: The epiphany, for me, was in photography. One day it dawned on me that photography is who I am and that whether I make a living from it or not, I can't stop the force. From that moment on I made pictures of whatever I was drawn to, and one of those things was food. I love the culture of food, the traditions behind it, the celebrations around this or that meal, the process of preparing a meal, etc. I find it truly beautiful, and I think I'd die happy if I got to spend my life documenting and sharing meals with people around the world. I want to share the diversity of good food stories that exist. What's interesting is that even though there are so many different stories out there, the one thing that underlies almost every single one is people's desire to be connected to each other and to celebrate some aspect of life together by sharing a meal. H: The pivotal moment came a couple of years ago when I fell victim to a round of layoffs, an experience that really shook me up while simultaneously freeing me from a field in my industry (financial news) that didn't feel quite true to me. Food had long been an interest of mine, but was quickly becoming more of a serious focus once I realized that I could try incorporating it with my journalism background - somehow, someway at least! C: We started the website ourselves! But I can't take credit for the idea. Hana called me up because she'd had a light bulb go off-to launch a blog that explores and documents home kitchens of food enthusiasts. We were dumbstruck that there wasn't already a blog dedicated to this endeavor, so we got right on it! It's been such a fun project, and we've been getting to meet a lot of awesome people with an array of talents-all of whom care about and love good food and where it comes from. H: Pantry Confidential is a true labor of love for Christine and me. We were both looking for a creative outlet and this pet project seemed like just the answer, playing on our respective strengths and of course, our shared passion for food and food culture on our own terms. Peeking into real people's pantries is just plain fun and a voyeuristic way that we can introduce readers to the truly wide breadth of food enthusiasts out there - in their own homes, no less! C: I didn't grow up with access to or knowledge about good food, or even with a tradition of celebrating holidays with extended family. So when I got older and started discovering it all on my own, I was totally fascinated. It was all new to me, which allowed me to approach it with intense curiosity and interest as a photographer. My background is in anthropology, not photography, although I have always loved photography. Technically speaking, I've taken a few classes, but I'm largely self-taught, or rather internet-taught. These days you can learn anything online, and mostly for free! H: I've always been a pretty curious (nosey? ;)) person, an apt trait for a journalist. I've been trained to ask certain types of questions to ellicit the most informative responses, and while I don't take such a pragmatic approach with Pantry Confidential, I do enjoy researching our "subjects" and learning about their background and motivation. It gives me a thrill to be able to share these finds with others.Working with many types of people and learning to juggle many tasks, often under deadline, are some other skills that I think have translated over well. C: We just got started, so we'll see what's in store for us. For me personally, quitting my full-time day job was the scariest but most necessary thing I've done. Now I have no excuse not to pursue my dream, warts and all. I'm very fortunate in that I'm not alone in my venture. Hana and our new project together has been a wonderful labor of love, pushing me and inspiring me to be a better photographer. And of course, I could not do this without my husband, who has always believed in me and supports me in more ways than I can count. H: As Christine pointed out, it's still too early too tell where this project will take us. Right now, we are truly enjoying every shoot and all the experiences that come with it; there's absolutely no sense of burden, only excitement! Of course, with culinary school and a full-time internship (an amazing opportunity that wouldn't have come along without culinary school), I'm operating with limited free time to devote to the site, so that's definitely the biggest challenge so far. H: I'll admit, sometimes I cringe at the number of "small batch," "handmade," "Brooklyn-based," "artisanal" products and vendors out there; but let's face it - we are now, more than ever, interested in where everything we consume comes from! I think people are really drawn to the story and face behind a brand, and if you're able to provide a high quality product or service on top of that (especially if it's "upcycled" - sorry, couldn't help myself! ), you're pretty much golden. C: A lifetime supply of good wine and film for my cameras would be pretty awesome. H: Cookbooks and bubbly would be nice. Sometimes in order to get your good food idea off the ground it warrants some multi-tasking of your own (we at Good Food Jobs still balance part-time, freelance and side jobs, occasionally, too!). Do you have hesitations about making the switch for that reason? If so, what are they?